North America's open roads wait! You ain't working for the Man any more! You're the owner of your own trucking business and you call the shots. Build your empire one rig at a time to dominate the roadways and outbid the competition. Can you handle the pressure? Your American Dream starts behind the wheel of your own big rig. 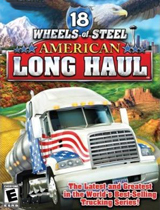 Comments: This game is very interesting you build a 18wheeler empire once done. You begin your travels all over the place controls are hard to use at first but once oyu get the hang fun all the way.